By now everyone knows that MOTORHEAD walk their own path and do things their own way. To celebrate 40 years of eardrum crushing, Motörhead Whisky is now being released in collaboration with beverage partner Brands For Fans and award-winning Swedish distillery Mackmyra. The un-compromising attitude that characterizes the band’s music is also obvious in Motörhead Whisky: bourbon-influences up front, it’s an alert and vital - almost cocky - perfectly balanced whisky with nice caramel and typical vanilla notes from American oak. 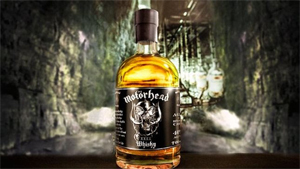 October 1 sees the release of Motörhead Whisky at Systembolaget in Sweden to start with, and the band have played an active role in both choosing casks and blends to put their name on the label. With Motörhead Whisky the band have made two top releases in one blow since the new album Bad Magic was just released earlier this summer and topped the charts in several countries. Lemmy Kilminster, MOTORHEAD's legendary front man, founder, gravel-voiced vocalist and bass player says: "Life is less painful with Motörhead Whisky. I may consider having a sip now and then." Mikkey Dee, MOTORHEAD drummer: "We think it’s great fun to launch a whisky in collaboration with a Swedish, world-famous distillery, Mackmyra. The whisky is incredibly good, with full character and fully flavoured with a superb bourbon touch, as it’s been aged in new American oak casks. All of us in the band have been active in the production process and are very proud over the result, and are happy to now launch such a great, characteristic whisky, MOTORHEAD-style." Sari Wilholm at Brands For Fans adds: "MOTORHEAD are legends, and it has been a tough job to find the right style and type of whisky for them to stand for. Mackmyra produces world-class whisky, and the rich bourbon flavour in Motörhead Whisky showcases the amazing blending talents of Angela D’Orazio. The band has been trying casks and blends and have found a smooth whisky with a tough attitude to release. We are incredibly proud to be a part of this release." Motörhead Whisky suits any occasion where you’d otherwise have chosen a bourbon, as well as times where a classic scotch malt whisky would have been your first option. Angela D'Orazio, Master Blender / CNO, Chief Nose Officer explains: "These wonderful oak barrels! I often come across fine barrels of whisky down in the mine, and here we have a bunch of great new American oak barrels that have matured a full five years. We talked about making a Swedish Malt Whisky with taste influences from Bourbon to the guys, - and there it was only waiting for us. For a little touch of something more, we added a small portion of whisky for six months ending on Oloroso oak barrels." For more on this product head to Brands For Fans right HERE.